Macromedia’s latest installment of its professional vector illustration package may not have an abundance of new features, but it does offer a few important improvements that are worthy of consideration. Always in close competition with Adobe Illustrator, Freehand’s last couple of versions have lagged behind in a few key areas while keeping ahead in others. 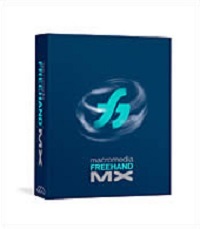 Freehand MX joins the new Macromedia interface standard and provides tools and features that help improve workflow to get designers where they want to go more quickly. As I have mentioned in reviews of other recent Macromedia products, the MX interface is a vast improvement over previous versions. Macromedia’s interfaces have always been clunky and unintuitive, until they rolled out the MX products. Adobe still does a somewhat better overall job at usability, but the MX line is closing the gap. Designers who have been using Flash and Dreamweaver will welcome Freehand’s familiar collapsing tab architecture. It takes up much less screen real estate than past versions and makes most functions more accessible. Novice users might have to dig a little to find what they are looking for, but the tools are well-organized and the iconography makes sense. The interface is also fully customizable. A couple of new panels deserve special attention. First, the context-sensitive Object Panel provides easy access and editing to an object’s attributes within a single panel. It’s very similar to Illustrator’s Appearance Panel, but is actually more convenient in that it provides buttons to quickly add more attributes to your selected object. And it’s more powerful—handling several different types of attributes depending on the object. What I find a little annoying is having to use this panel exclusively to design gradients or special fills. It would be nice if there was an option to break gradient design out to a separate panel. Also similar to Illustrator is the ability to drag from the Object Panel to the Styles Panel to save these attributes for reuse with a simple click. The new Answers Panel is a very impressive feature. It’s basically an in-program link to tutorials, technical information, articles, and featured projects. Of course, clicking on a link in the panel will bring up a browser window, so an internet connection is necessary to utilize it. But it’s much easier than having to dig through the Macromedia site to find application-specific information. It’s not just aimed at those learning how to use Freehand—I’ve referenced the technotes a few times from this panel. More software companies should implement this type of dynamic information into their projects. Usually software makers tend to throw a cheesy effect or useless toy into the toolbox of a new version, but essentially all of the new tools offered in Freehand MX are powerful and aimed at professional users. I’m guessing that Macromedia has been consulting closely with designers, because these tools seem to register high on a lot of want-lists. The Extrude tool is something that used to be provided solely by third-party plugins. Problem was, once an extrusion was performed, it could not be revised. Freehand MX’s Extrude tool is pretty amazing. Not only does it do a great job at delivering simulated 3D extrusions, but you can edit it an unlimited number of times. The Extrude tool provides two dragging points per object—one specifies the angle, while the other controls depth. Not only that, but other controls in the Object Panel handle more precise extrusion dimensions, surface fill, lighting, number of steps, and the profile. The profile settings really wowed me— it actually allows you to twist the interim points to give the extrusion an uneven profile. This can result in more natural-looking or interesting geometric, fractal-type extrusions. These controls are somewhat like what you get in a 3D application, but, of course, this is just a simulation and will not give you rotated objects—just extrusions. Flash users will recognize the new Eraser tool. It allows you to erase just as you would in a raster-based application. This results in a revised vector shape or group of shapes. It’s a godsend for vector illustrators. I can’t tell you how frustrating it sometimes is to try to edit points when it would be much simpler to have a tool like this. I only wonder why Macromedia waited so long to add it to the Freehand toolset. If you use a vector application to construct diagrams, charts, or other infographics, pay close attention to the new Connector tool. When I first saw this, I immediately recognized its timesaving and creative potential. It’s very simple to use—just select the tool and drag from one object to another. Instantly, a line is created between the two. This line will revise itself anytime you move one of the objects to maintain a consistent visual connection between the two. No more having to redraw these kinds of lines every time you have to make a revision. What’s more, the connecting lines themselves are fully editable, so you can produce any type of visual style you need. A nice new Web-specific tool is the Action tool, which assigns links and Web actions to your objects. This tool is a little tricky to get the hang of, but works well once you know what you are doing. It seems to be useful for both standard Web and Flash uses, and makes it a snap to turn multi-page Freehand layouts into interactive Web presentations. In addition to the new tools, Freehand MX offers new drawing features and improvements to existing tools. The Pen tool now sports something called “rubber banding,” providing the user with a live preview of the next segment of a path. While it has the potential to confuse, I think it’s a welcome new feature that will cut down on the hassles of point editing. The Blend tool is improved over previous versions, making it easier to create and control blended objects. With this single tool, you can set blends between objects, then rearrange the objects to your liking. Blending between multiple objects is as simple as doing a bit more dragging. It’s fantastic. Adobe needs to check out this tool and rethink their antiquated version. The new Calligraphic Stroke feature enables quick conversion of a single-weight stroke into a more natural, variable-weight line. While not revolutionary by any means, it’s certainly nice to have. Somewhat similar to the Extrude tool, the new Live Effects perform transformations to your objects and remain editable. There are both vector and raster effects, which range from object reflection to gaussian blur and emboss. The Live Vector effects will probably see more professional use, as the Live Raster effects tend to be more of the “eye candy” variety. In other words, use with extreme discretion. Then again, it is amazing that these types of effects are found in vector applications, much less that they remain editable. Illustrator offers a similar feature through its effects menu, although there are less controls over parameters—so for the most part they cannot be considered live. Gradient fill options and controls are significantly enhanced in Freehand MX. There are several types of gradient fills available, and different mode types such as Repeat and Reflect give further choices. Also new are gradient fill handles, allowing users to modify gradient angle and spread with a quick drag. While these improvements are great, I still have a couple of complaints. First, it’s a bit inconvenient to have to drill down in the Object Panel to edit and create gradients—it would be nice to have the option of a separate Gradient Panel. Also, the gradient options still don’t offer the sophistication of Adobe Illustrator’s Gradient Mesh tool. Macromedia needs to look into providing such a naturalistic gradient creation tool in Freehand. It’s one of the key features that keeps Illustrator open on my desktop more than Freehand. But that’s not to say that Freehand doesn’t have obvious advantages over Illustrator. Perhaps the best example is Freehand MX’s ability to create multi-page layouts within a single document, plus create multiple master pages and backgrounds. This provides real power, and does away with the necessity for a separate layout/publishing application. Macromedia has also improved the creation of Flash animations directly from Freehand. The Movie Settings Panel is similar to the export options dialog in Flash and makes for simple transitions from illustration to animation. Also similar to Flash is the new symbol library, which facilitates reuse of common elements throughout documents. It can be argued that the biggest advantage of Freehand is its tight integration with Macromedia’s other Web design products. Freehand files are easier to deal with in Flash than Illustrator files, and both Flash and Fireworks have been developed with tight Freehand integration in mind. Again, whether you choose Freehand or Illustrator (or another vector program) largely boils down to your specific workflow and what kinds of features you need. These applications are not “all the same,” and each has its own particular advantages. I use either Illustrator or Freehand depending solely on the requirements of the project. Freehand MX is a solid improvement over previous versions, offering a much-improved interface and exciting new tools and features. It provides much more screen space for documents, and is customizable according to your needs. It’s a powerful application that offers several features that no other vector application has. I have found Freehand MX to be a bit more stable than Illustrator /files/includes/10.css on Mac OS /files/includes/10.css. 2, with no freezes or crashes so far. However, some tools are a bit of a pain sometimes and it seems that I often have to try a few times to select some tools and objects. There are also some features that are hidden that could use a panel of their own. Overall, though, I will be using Freehand MX much more in my professional work than previous versions because of the new features and improvements.